The results of a survey about the 24 Hour Recovery system. I sent a survey questionnaire for 1 year starting from February 2013 to all the patients who had taken augmentation mammoplasty from me, and 172 patients responded. Hi, this is KIES-U plastic surgery clinic. Our hospital always explains "24 hour recovery system for water drop breast surgery" to patients. 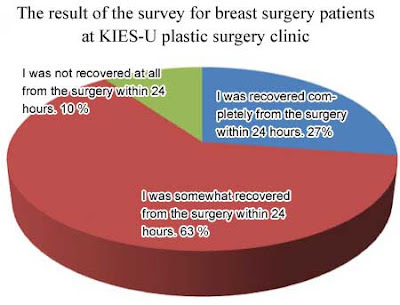 We are conducting a survey about whether patients are recovered from the breast surgery within 24 hours. It will be appreciated if you reply with the number of your case among the following three items. 1. I was recovered completely from the surgery within 24 hours. 2. I was somewhat recovered from the surgery within 24 hours. 3. I was not recovered at all from the surgery within 24 hours. 90.1% of the total respondents responded positively about 24 Hour Recovery. 9.9% of the respondents responded that they were not recovered at all within 24 hours. 1) When the inserted implant was very big. 3) When the patient was in a bad condition on the operation day. The numerous reasons can be summarized like this. If the size of an implant is too big for a patient's body shape, dissecting wider space is required and bleeding or pain sensory touching may happen in the course of this process, which leads to lasting pain. When the patient's skin is very tight, pain-feeling organs like periosteum gets pressure until the skin gets extended to accommodate an implant and this tends to make patients feel continuous discomfort.